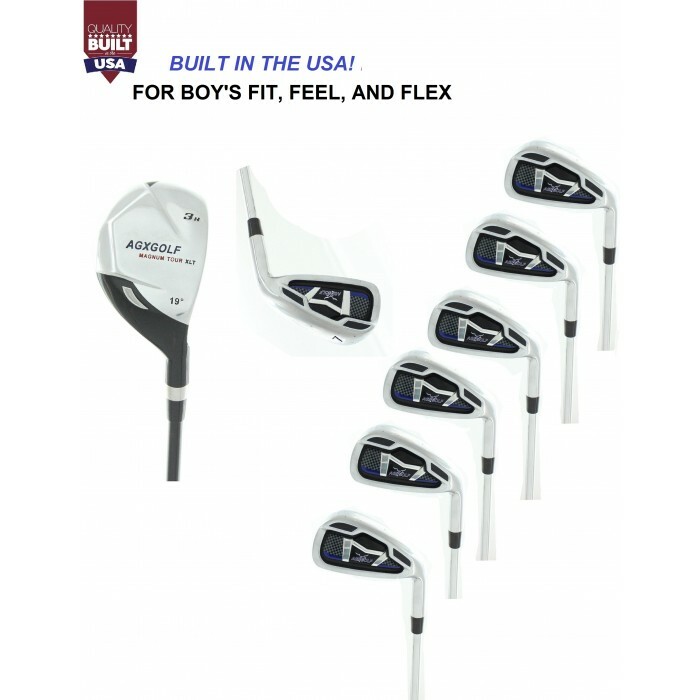 AGXGOLF MAGNUM SERIES: BOY'S LEFT / RIGHT HANDED **BUILT RIGHT HERE IN THE U.S.A. FULL IRONS SET: INCLUDES #4 HYBRID w CALLAWAY X-TOUR STYLE 5 THROUGH PITCHING WEDGE IRONS (OPTION TO UPGRADE TO GRAPHITE SHAFTS) + OPTIONAL SAND WEDGE w/BOY'S FLEX STAINLESS STEEL SHAFTS. BAM!!! 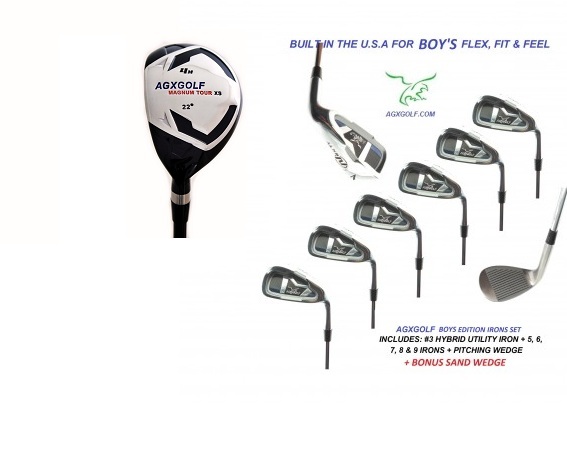 THE SAME COMPANY THAT BRINGS YOU THE TOUR EAGLE GOLF CLUBS HAS DESIGNED THE MAGNUM EDITION IRONS FOR BOY'S..! The Manufacturer's Suggested Retail Price for this set is $229.95; Your price is MUCH BETTER!! This FULL set of IRONS for BOY'S from AGXGOLF is an ADVANCED full technology package!! DISTANCE Down the FAIRWAY! That's what you can expect from the MAGNUM HYBRID IRON: This club head design technology, plus the SUPERIOR SHAFT TECHNOLOGY produces a club with awesome swing speed and distance. The masterfully crafted Irons are real SHOT MAKERS! 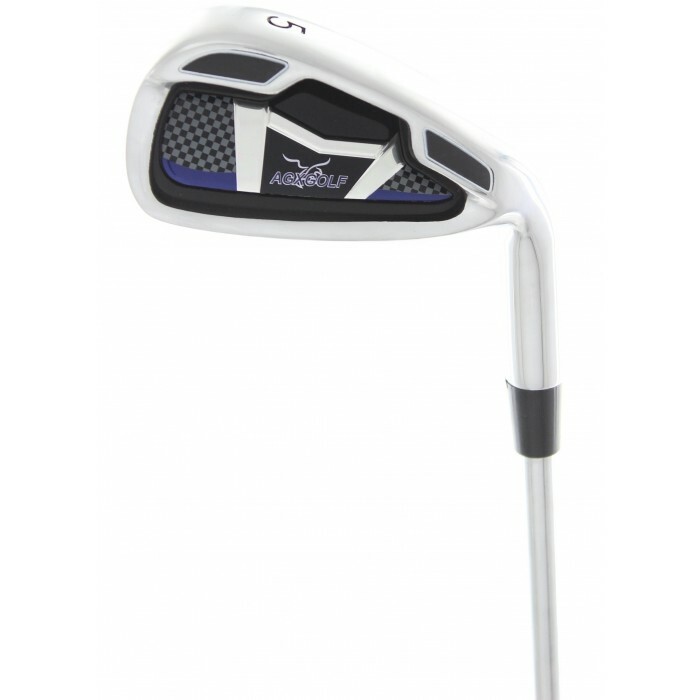 The OVERSIZE heads with the Cavity Back & Perimeter weighted club head design (INSPIRED by the popular CALLAWAY X-TOUR IRONS) makes it much easier to hit a nice HIGH STRAIGHT shot while still allowing you to work or shape your shots!! What makes the PERIMETER WEIGHTING so effective is the Physics behind it: Having the weight distributed to the perimeter of club head increases the moment of inertia; this reduces the torsional rotation of the club head. Simply put: the club head is more likely to come through the ball square" and that means more straight shots and less hooks and slices!!! We know that many companies sell cut down Men's Irons as Boy's Clubs. These Magnum Iron's for Boys are built from scratch to fit a Boy's Swing Profile for Flex and Feel. The fact is, Boy's have not reached Adult strength so you cannot expect optimum performance from adult clubs. 4 HYBRID UTILITY IRON: combine the power of a wood with the accuracy of an iron. 5, 6, 7, 8 & 9 IRONS: Stainless Steel heads, Cavity Back - Perimeter Weighted and OVER SIZED for maximum forgiveness and accuracy. The Low Gravity construction provides tremendous power and loft. AGXGOLF is headquartered in Michigan and they've been around for a long time (even longer than we have)! We've been playing their Golf Clubs since we were kids and have been nothing but satisfied and we GUARANTEE that you will be too!! So if you are looking for quality set of Over-Sized Irons for Boy's, but not an OVER-SIZED price tag, then we think you will be very happy with this set! !